Domestic entrepreneurship makes homeschool and family business ascertaining a sustainable private property as inheritance for your next generation. We are not everyone. Everything is not going to help us either. Programming gives us ultimate pleasure so we do require inventing our patronage network. We do that by aggregating our programming power from worldwide for distributing across all countries alike as online support via system@sangkrit.net to get paid by our domain registrants in hourly per terminal basis. Patronage networks are necessary to make anyone survive and thrive. They make your world. No seed thrives without a patronage network around it. If there is none, you need to find one. Sangkrit is such a patronage network to make the most of people survive and thrive simply by following its code that mandates for cleaning your place, cooking your meals, programming your world and blogging your knowledge. It is quite affordable for everyone to startup into this. Life is limited. You should be very careful about investing your time and attention in only useful things. Free will of the individual for independent initiatives in entrepreneurship is the driving force of success. That could develop and diversify any domestic entrepreneurship. Domestic entrepreneurship makes homeschool and family business ascertaining a sustainable private property as inheritance for your next generation. Endogamy within same trade makes more sustainable families. Thus a particular class becomes a particular caste in process. Independent castes work as great patronage networks. They do better than trade unions. This makes every family work together to grow together and no family member gathers a world apart from others so they sustainably stay together. 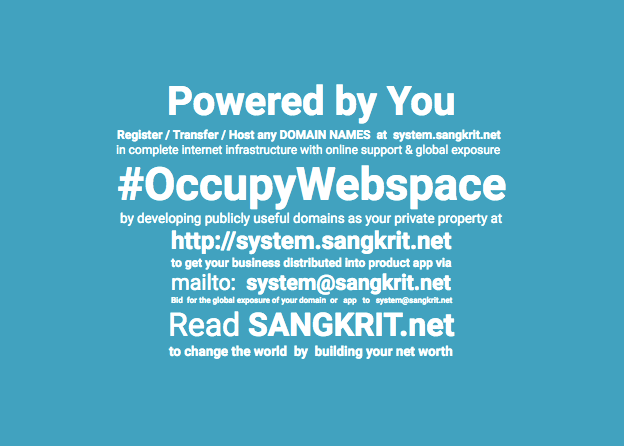 Thus Sangkrit builds a whole new world that works better. Professional programmers make its world to work. Users make its reality. Beyond that this doesn’t entertain others. Unlike China’s corrosively closed future, democratic India could open up as the global opportunity of humanity spread between China and Arab, across many countries alike, assimilating many peoples altogether, making a common market including all of them. Going through a storyline mostly grips you in attachment with a particular side of context damaging your independent observing awareness. This happens more often than not like whenever you watch a movie, game or news. Try practicing chess by playing from both the sides to balance your observing awareness for seeing neutral. Seeing neutral is the most difficult but true vision. This time SAARC has survived by refusing a summit in Islamabad as India is emerging in the interest of south Asia and world. Abolishing all apartheid India integrates humanity fully well that include the most of Muslims also in south Asia. India sustainably stood, where even Arab failed and Europe didn’t succeed so there was no reason to let Pakistan occur. Now unlike China’s corrosively closed future, democratic India could open up as the global opportunity of humanity spread between China and Arab, across many countries alike, assimilating many peoples altogether, making a common market including all of them. What troubles all these prospects is a failed state named Pakistan that was artificially forked on discriminating basis of political Islam that goes up to the extremism of Islamic State with atom bombs threatening the humankind. Human history won’t ever absolve Anglo-American imperialism of United Kingdom and United States of America for inciting this evil against humanity. Enforcing Arab culture everywhere in the name of a religion historically brought an apocalyptic havoc on different civilizations thrusting constant influx of refugees worldwide. Women and children suffer utmost. Humanity bleeds across all countries alike. The most important necessity in this constantly coercive circumstance is to keep the homeland security intact everywhere. There is no other way to keep a constant check except to start profiling all Arabic style individual names to begin with an effective vigil against extremism, avoiding all mishaps in ensuring homeland security. Failing in doing that endangers the public security of humankind. Any failure in keeping the order intact is the worst crime on planet earth so homeland security failures must not go unpunished. Free men and free women love free internet but they cannot stay free without a free homeland for their civilizations so that certain evilizations, which are very much disrespectful for the freedom of women, children and internet, just cannot ever end humane harmony. Reality is the assertive illusion so accordingly to change it you do require getting adequately more assertive. For upgrading humankind into internet age, you should start by opening your free SANGKRIT.net account as a personal outlet of internet growth engine to help everyone in using internet infrastructure, online support and global exposure. Still you get only what you deserve so better learn to deserve far better by designing your desires pretty well. Your quantum reality is relayed as per your observing awareness. Reality is the assertive illusion so accordingly to change it you do require getting adequately more assertive. The real world gets made by the quantum realities of everyone involved. To make the world better, Sangkrit insists upon economic independence, humane integrity, public security and legal reforms as per the smartphone stage of internet age across all countries alike. Domestic entrepreneurship developing family business may make many generations independent. The globally distributed order of internet growth engine SANGKRIT.net must prevail manifesting humane integrity by integrating humanity. People across all countries do require enhancing democratic awareness about success/failures of homeland security setups. Protecting the populace is a state job. They get paid in revenue for doing that. Independent of all distractions, they must be successful in fulfilling their this duty. Peoples’ representatives are elected to make laws as per public aspirations. The personal outlets of SANGKRIT.net must become adequately efficient in changing the observing awareness of everyone around to change the world so only humane order prevails through that.